The biennial UB Women’s Conference kicks off on Friday, September 28, in Toledo, Ohio. They have a capacity registration of 250. The conference will be held at Renaissance Toledo Downtown Hotel. Shirley Fretz, who served 18 years as a United Brethren missionary in Sierra Leone 1967-1985, passed away Wednesday, September 26, 2018. She had suffered from Huntingtons Disease during the last several years. Funeral time: 1pm on Saturday, October 6, 2018. Shirley grew up at Grace UB church in Sherkston, Ontario, a church that has produced a number of missionaries over the years. She dreamed of being a missionary like Olive Weaver and Ruth Benner, two women from the church who were then serving in Sierra Leone. Shirley spent ten years working for law firms, but couldn’t get missions out of her mind. She eventually responded to an altar call by Bishop Clyde W. Meadows, a call to serve Christ wherever God wanted. Before she knew it, she was contacted by the UB missions office. They needed someone to oversee the Minnie Mull boarding home in Sierra Leone. Was she interested? Shirley arrived at Minnie Mull in April 1967. The school had over 400 primary-age girls with 104 staying in the boarding home. 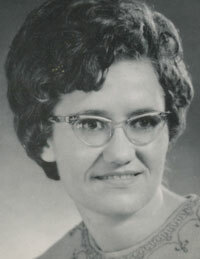 Shirley procured supplies, kept financial records, helped supervise cooking and laundry, counseled children, and generally served as a mother to over 100 youngsters. Her second term, which began in August 1971, found her in a whole new role: business manager of Mattru Hospital. She spent the next ten years handling the payroll, bookkeeping, banking, and other non-medical responsibilities. After the 1974 arrival of Dr. Ron Baker, Shirley watched Mattru develop into a thriving hospital. Shirley decided the hospital needed a male administrator, especially since the culture favored having men in supervisory positions. So after her 1981 furlough, she moved to Bumpe and spent two terms working in Christian education. For four years, she devoted much of her time to the Bumpe Primary School children. After school, kids walked to her house for Bible classes, and she often provided one-on-one spiritual counsel. Later, her job was placed under the direction of the national church’s Christian Education Department. They held clinics and workshops in various districts, helped with the camping program, and emphasized Christian Endeavor. During her furlough in 1983, Shirley had a difficult decision to make. Her father had been hospitalized with cancer almost continuously since July 1982. Should she stay home and await his death, or return to Sierra Leone in December as scheduled? Shirley later recalled, “My dad was very alert right up to the end. He knew exactly what was going on, and I’m sure that if I had visited him the day I was supposed to leave for Africa, he’d have said, ‘What happened? Why didn’t you go?’ I knew he would be gone soon, and it would be good for me to be there, but you can’t just stay home and wait for something to happen.” She left at the end of November and arrived in Bumpe on December 6, 1983. The next day she received a telegram saying her father had passed away on December 6. Wanting to remain in some kind of mission work, in December 1985 Shirley became receptionist-bookkeeper for the Brethren in Christ mission office in Stevensville, Ontario. 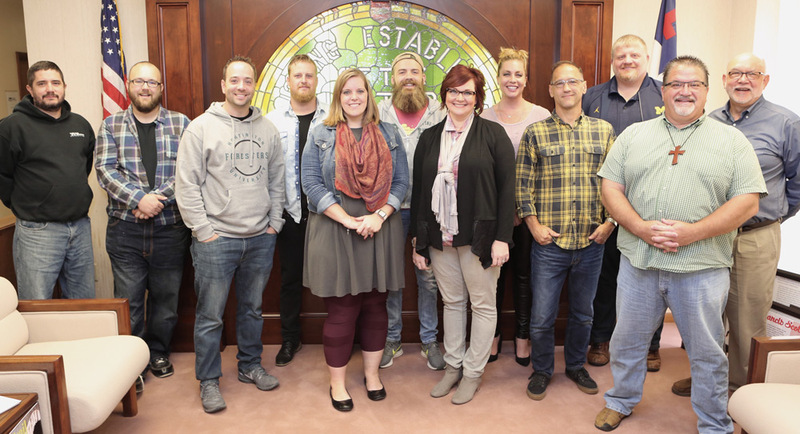 L-r: Brandon Baker, Andrew Franks, Eric Griffon, Cody Morehead, Julie Llewellyn, Nick Balsiger, Lissa Litka, Tomi Cardin, Dennis Wood, Cyle Young, Brad North, Bob Bruce (instructor). Eleven persons took the two-day United Brethren History Course on September 24-25. The class was held at the United Brethren National Office in Huntington, Ind. The instructor was Bob Bruce, pastor of Caring Ministries at Emmanuel UB church (Fort Wayne, Ind.). Brandon Baker, Discipleship pastor at Praise Point UB church (Willshire, Ohio). Andrew Franks, Youth pastor at New Hope UB church (Huntington, Ind.). Eric Griffon, Worship pastor at Fowlerville UB church (Fowlerville, Mich.). Cody Morehead, lead youth worker at Heart O the Lakes UB church (Brooklyn, Mich.). Julie Llewellyn, director of Early Childhood Ministries at Emmanuel UB church (Fort Wayne, Ind.). Nick Balsiger, associate pastor of Discipleship & Student Ministries at The Well (Huntington, Ind.). Lissa Litka, Spiritual Journey director at Morning Star UB church (Kokomo, Ind.). Tomi Cardin, member of the Executive Leadership Team, board chairperson at Anchor UB church (Fort Wayne, Ind.). Dennis Wood, senior pastor of Park UB church (Bluffton, Ind.). Cyle Young, senior pastor of Heart O the Lakes UB church (Brooklyn, Mich.). Brad North, senior pastor of South Scipio UB church (Harlan, Ind.). 25 Sep Position Opening: Fulltime Worship/Assimilation Pastor in Woodland, Mich.
Kilpatrick UB church (Woodland, Mich.) is seeking a fulltime Worship/Assimilation Pastor. We are a church in rural Michigan between Grand Rapids and Lansing. 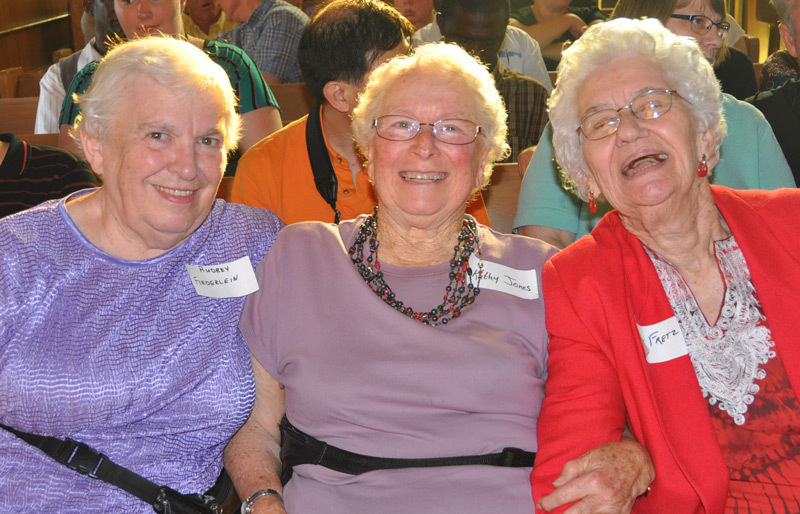 Kilpatrick Church ministers to a 300+ congregation each week. The Worship/Assimilation Pastor is full-time with responsibilities encompassing a dual role. The primary responsibilities of this individual are to oversee and/or lead all musical worship ministry at Kilpatrick Church and to oversee and develop the Assimilation ministry, enabling guests and regular attendees to become connected to the Kilpatrick Church body. Download the complete job description here. In the United States, we are currently watching Hurricane Florence pound the Carolinas. Meanwhile, on the other side of the world, United Brethren in Hong Kong and Macau are preparing for Super Typhoon Mangkhut, the largest storm recorded anywhere in the world during 2018. Mangkhut had wind speeds of up to 200 mph before slamming into the northern Philippines Saturday morning as a Category 5 storm. The wind speed is now around 165 mph (losing the “super” status). Mangkhut is expected to hit Hong Kong, where we have about ten churches, and nearby Macau on Sunday afternoon. Hundreds of flights have been cancelled, and numerous other emergency preparations are being made. One report says Typhoon Mangkhut could be the strongest storm to hit Hong Kong in 60 years. In 2017, ten people died in Macau from Typhoon Hato, the strongest storm to hit the city in 50 years. During your Sunday morning service, perhaps your church could remember in prayer the people of Hong Kong, Macau, and Guangdong Province, and particularly the United Brethren members and missionaries in those places. Location: UB National Office, 302 Lake Street, Huntington, IN 46750. The United Brethren History Course is a requirement for ministerial licensing in the United Brethren denomination. However, people who just want to learn more about United Brethren history are welcome to take the course. The course is held periodically in regional settings. For United Brethren ministers, the course qualifies for 12 credit hours. The instructor is Rev. Bob Bruce, Pastor of Caring Ministries at Emmanuel Community Church in Fort Wayne, Ind. He has been teaching the course since 2012. Go here for more information and to register. Nancy Ngele, a former United Brethren missionary in Sierra Leone, is offering her home, at a very reasonable price, to someone who has served as a United Brethren pastor or missionary for at least eight years and is ready for retirement. The home is located on the Carson City Christian Camping Center in Central Michigan. 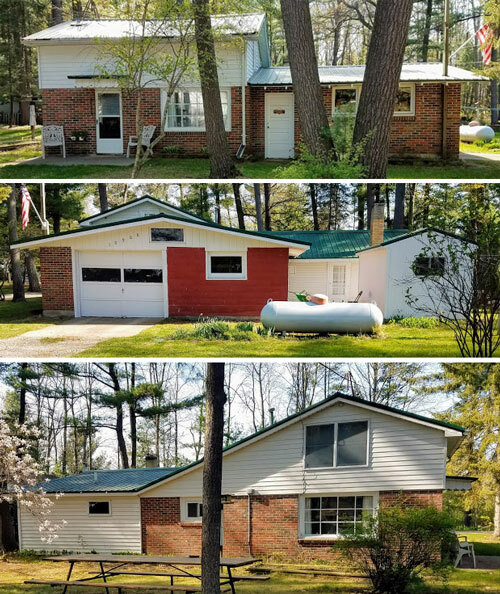 This house has two bedrooms upstairs and a ground level room that can be used for a master bedroom or a family room with a Franklin stove and gas furnace. One bathroom has a vintage tub, and another that is handicap accessible, has a step-in shower. Appliances include electric washer and dishwasher, gas water heater, dryer and a new gas wall furnace in the kitchen. Large storage drawers and enclosed shelving are built in, along with handy kitchen cupboards. An attached garage has room for one car and lots of storage or space for a workshop. A free-standing shed at the back of the house and garage is available for additional storage. Green, steel roofs cover the house, garage, and shed. The house might also be considered for a summer cottage or hunting lodge. For further information, call Nancy at 989-235-4448. Here are details for the viewing and funeral for Rev. David Bell, who passed away Saturday, September 8, 2018. Viewing: Tuesday, September 11, 2-4 pm and 6-8 pm. Funeral: 11 am Wednesday, September 12. Viewing one hour beforehand. Location of viewing and funeral: First UB church, 1900 Eastbrook Road, New Castle, PA 16101. 08 Sep Obituary: Rev. David Bell, New Castle, Pa.
Rev. David Bell, a United Brethren minister since 1984, passed away at 8:15 Saturday night, September 8, 2018. He was 69 years old. Dave had recently been diagnosed with ALS (Lou Gehrig’s disease), and it progressed rapidly. A few days ago, he was placed in hospice. Dave grew up on a farm in Franklin, Pa. After graduating from high school, he enlisted in the Marines. Before leaving for Vietnam, he eloped with the love of his life, Kathryn Ann Henderson, and married her on June 28, 1968. They were married for 50 years and raised a son and three daughters. Dave went on to receive Bachelor and Master of Divinity degrees from Asbury College and Seminary. He pastored at Fuoss Mills Christian Missionary Alliance and Faith Country Chapel in New Castle. In 1984 he joined the United Brethren church, and spent the next six years planting a church in Erie, Pa. Since 1990, he has been pastor of First UB church in New Castle, Pa. In lieu of flowers, memorial contributions may be made to the ALS Association, PO Box 37022, Boone, IA 50037-0022 or by visiting alsa.org. 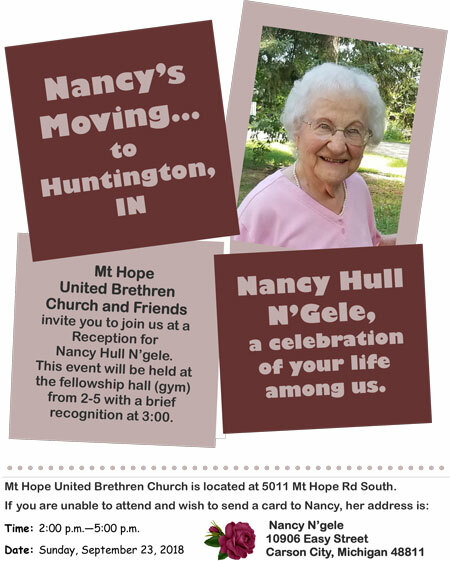 Nancy Hull N’Gele, a UB missionary in Sierra Leone 1957-1970, is moving from Michigan to Huntington, Ind. She has been a longtime resident of Carson City, Mich., living in a home on the Carson City Campground. Mt. Hope UB church in Carson City will host a reception for Nancy 2-5 pm on Sunday, September 23, 2018. Anyone is invited to attend to recognize the life and service of this former missionary.